So it’s time to get the last summer blog post out of the way and move on to more weather-appropriate sewing. First can we talk about the beauty of analog photos? For the first time in ages we decided to take our analog camera on holiday and I love how the pictures turned out. 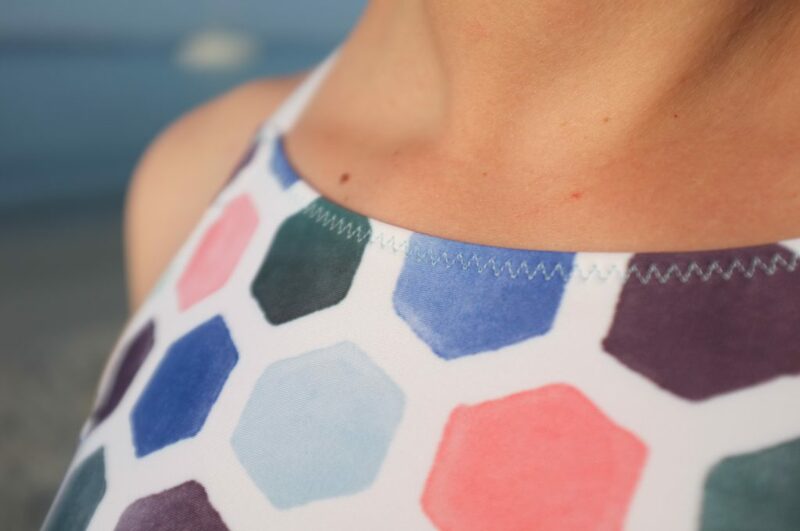 I especially love the snapshot of my new Sophie Swimsuit (above). Swimsuit sewing had been on my list since knowing that we would have a 2-week beach holiday in the south of France this summer. 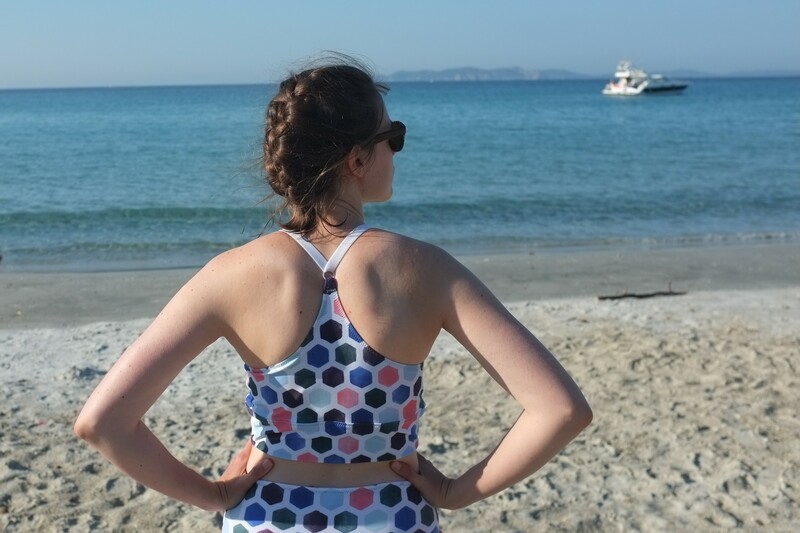 I wasn’t settled on a pattern until Heather of Closet Case Files released the Sophie Swimsuit and I immediately knew it would be the perfect pattern. After having practised sewing swimsuit fabric on the simpler Noelle Swimsuit I felt prepared enough to dig into this more complex pattern. Fist I had to find all the materials though. 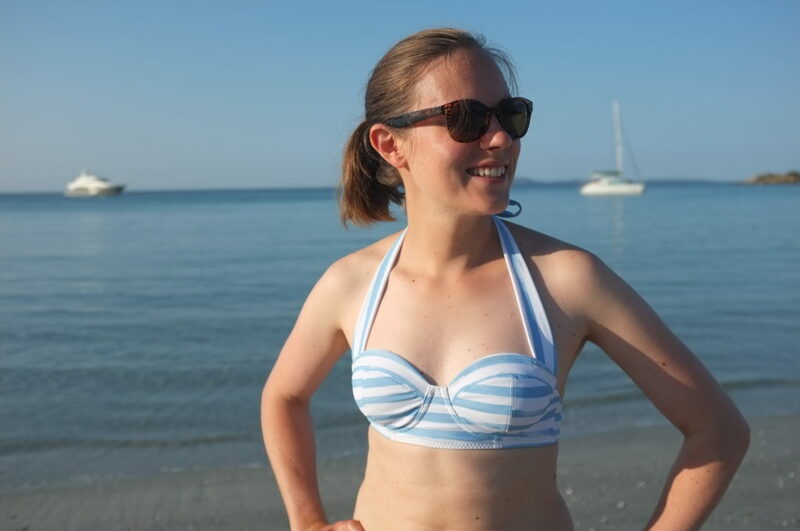 The fabric issue was solved with again using fabric from Contrado, based on a simple brush-stroke stripe design (you need to wear stripes when beaching in France right?). Same as for the Noelle Swimsuit I chose Slinky Lycra Matt, which again was the perfect choice. Then the notions. For this padded underwire bra style quite a lot of different notions are needed and it took me ages to find the right ones (if someone knows good UK or European online shops with a good range of swimwear notions, please let me know!). In the end I got most of it from MacCulloch & Wallis, a London shop that I had ordered from before. They stocked the bra foam padding, underwire channelling, S-hook closure and the swimsuit elastic. The foam was only sold by the metre, so I have bra foam for a lifetime. Both the foam and the underwire were normal bra making materials, not specifically for swimsuits, I couldn’t figure out if that would be necessary. The underwires I had left over from bra making, ordered from the Merckwaerdigh Etsy Shop, the swimsuit lining I got off ebay. When I purchased the pattern, I considered buying the video workshop, which I’m sure would have been great. Since I had made an underwire bra before, however, I decided the pdf pattern would be enough. As always with Closet Case Files patterns the instructions are very thorough and the blog has great posts that walk you through some of the main points. 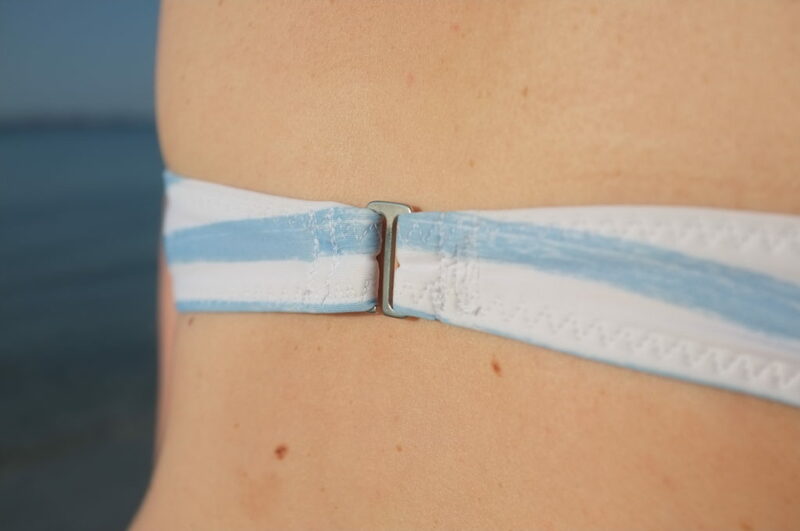 The sewing started with some head-scratching though when it came to choosing the sizing for the bikini top. When I measured my bust, the chart put me in a cup size between a 4 and a 5 (5 being the biggest size). I made sure to read the corresponding blog post on the sizing and other reviews and knew that these cup sizes don’t correspond to the normal A, B, C sizing. Still, I’m just about an A cup and the underwires would have been between a 36 and a 38, which based on the wire size chart were a lot bigger than the underwires of my bras. I also hadn’t purchased any underwires as I had a bunch left over from the bra making, so I decided to use the ones I had (size 32). Just to make sure the cup wouldn’t turn out too small I basted the cup pieces together and checked the fit, which seemed fine. While I’m not an expert on the fit of bras, I don’t feel the final bikini top is too small. I did notice though that the top does have more coverage on others that have sewn it up, so maybe a slightly bigger cup was intended. I might test out a bigger cup size next time. Overall the construction was quite straight-forward and the whole thing came together quickly (which was necessary, as I sewed it up the day before going on holiday). The only issue were some raw edges at the corners of the cup that were not enclosed properly. I might have just not been exact enough when cutting and sewing. The problem was quickly solved with some hand stitches. Next time I’ll also make sure to stretch the upper layer a little bit tighter over the cup. As it is now, it wrinkles slightly. Another thing, that I would want to resolve are the wrinkles at the cradle. This is an issue that many versions online have (even the product photos), probably caused by the stretchiness of the cradle fabric. The pattern tells you to underline the main fabric with some non-stretchy material. I had some netting left over from my last bra, which is supposed to be non-stretch. It still it had a little bit of give, which will have caused the wrinkles. I’ll make sure to hunt for something more suitable next time. For the closure I decided to go for a simple silver S-hook, which turned out really pretty and looks a lot fancier than the typical plastic bikini closure. 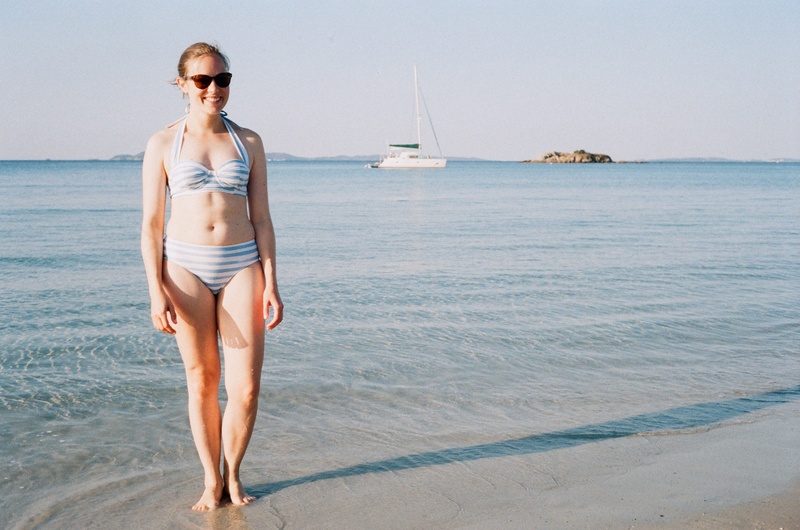 Overall the bikini turned out lovely, perfect for our time at the Côte d’Azur. It’s held up really well and is comfortable to wear. The only issue is that the cup foam soaks up all the water (bra making foam might not be that suitable for swimwear after all) and I had to wring out the top after swimming, to avoid dripping the whole day. Still nothing that would have prevented me from wearing it. I would love to make another Sophie Swimsuit at some point. I have some lovely floral fabric that I want to use, possibly in combination with some stripes or some solid fabric. Or I’ll make another one playing around with the stripes. I’ve seen some lovely versions online doing that (e.g. Selmin’s lovely Sophie). So, that’s it for summer sewing. I’m really sad to see summer go, and am trying hard to get excited about autumn sewing. I’m thinking rust, velvet and tutlenecks (maybe not all in one … but then again, why not? ).